Circulating Spexin Levels Negatively Correlate With Age, BMI, Fasting Glucose, and Triglycerides in Healthy Adult Women. CONTEXT: Spexin is a newly identified neuropeptide that is involved in satiety control, glucose, and lipids metabolism. It has also been related to human diseases, such as obesity and type 2 diabetes. However, whether spexin changes with age or not is still unclear. OBJECTIVE: The aim of this study is to investigate the relationship between circulating spexin levels and age and to study their interaction effects on body mass index (BMI), fasting glucose, and -lipids. DESIGN AND PARTICIPANTS: This is a cross-sectional study, including 68 healthy adult women whose ages are in a wide range (minimum: 23; median: 38.5; maximum: 64). OUTCOME MEASURES: The serum spexin levels were measured by an enzyme-linked immunosorbent assay. Fasting glucose, total cholesterol, triglycerides (TG), alkaline phosphatase, alanine aminotransferase, aspartate aminotransferase, urea, and creatinine were measured by routine biochemical test. Shapiro-Wilk's test, Spearman and Pearson correlation analyses, χ2 test, and two-way analysis of variance were used to interpret the data. RESULTS: Serum spexin levels are significantly correlated with age (Spearman r = -0.277, P = 0.022), BMI (Spearman r = -0.445, P < 0.001), fasting glucose (Spearman r = -0.302, P = 0.014), and TG (Spearman r = -0.324, P = 0.008). Spexin levels independently predict the risk of high BMI and high fasting glucose. No interaction effects of spexin and age on BMI and fasting glucose were found. CONCLUSIONS: Circulating spexin levels decrease with age, suggesting a possible role of this peptide in aging-related functions and disorders. Further investigations are needed to expand the clinical significance of this finding. This publication used a Spexin EIA kit (EK-023-81) from Phoenix Pharmaceuticals to measure human spexin level in serum. Spexin Acts as Novel Regulator for Bile Acid Synthesis. Spexin is a novel hormone involved in obesity and diabetes while its biofunctional significance in lipid metabolism is still to be comprehended. Global metabolomic analysis in the present study revealed multiple metabolic pathways altered by spexin intraperitoneal (i.p.) injection in rat serum, which are highlighted by the changes in several bile acid metabolites. In rats, spexin (300 μg/kg) could dramatically reduce hepatic and circulating total bile acids (TBA) level compared with the controls. Correspondingly, treatment with spexin by i.p. injection for 28 days led to significant decrease in serum TBA and gallbladder weight in C57BL/6J mice. In enterohepatic circulation system, spexin effectively reduced TBA levels in mouse liver and gallbladder but not the intestine. Hepatic cholesterol 7α-hydroxylase 1 (CYP7A1) expression, unsurprisingly, was suppressed by spexin injection. Both GALR2 and GALR3 antagonists reversed the inhibitory effects of spexin on concentrations of serum TBA and 7 α-hydroxy-4-cholesten-3-one (C4), and hepatic CYP7A1 expression. Finally, negative correlations were observed between serum spexin and total cholesterol (TC), total bile acid (TBA), tauro-chenodeoxycholate (TCDCA), as well as glycochenodeoxycholate (GCDCA) in 91 healthy volunteers. These findings illuminate the intrinsic importance of spexin in the regulation of bile acid synthesis and metabolism. This publication used a Spexin pepetide (023-81) from Phoenix Pharmaceuticals to perform i.p. injection and evaluate spexin in brain and peripheral tissues. Lin CY, Zhao L, Huang T et al., Front Physiol. 2018 Apr 10;9:378. doi: 10.3389/fphys.2018.00378. eCollection 2018. Spexin Suppress Food Intake in Zebrafish: Evidence from Gene Knockout Study. Spexin1 (SPX1) is a newly discovered neuropeptide in vertebrates. Its biological function remains to be elucidated. In this study, we have generated the zebrafish spx1 -/- mutant lines using transcription activator-like effector nucleases. Phenotypes of the spx1 -/- mutant zebrafish were analyzed in order to understand the effects on reproduction and food intake. The reproductive capability is not impaired in spx1 mutant zebrafish. However, we found that the spx1 -/- mutant fish had a higher food intake than the wild type (WT) fish. Real-time PCR revealed that the expression level of agouti-relate protein 1 (AgRP1), a significant appetite stimulant, was significantly higher in spx1 -/- mutant fish after feeding. Intracranial administration of SPX1 could also reduce the mRNA expression of the AgRP1. These data suggest that SPX1 might decrease the food intake by down regulating the expression level of agrp1. Furthermore, spx1 -/- mutant fish exhibited higher glucose, triacylglycerol and cholesterol in the serum than WT fish. However, the hyperphagia did not lead to a higher growth rate or body fat percentage. Taken together, our study suggests that SPX1 may serve as a satiety signal molecular by suppressing the AgRP1 in the brain. This publication used a Spexin antibody (H-023-81) from Phoenix Pharmaceuticals to identify the expression of spexin in brain and peripheral tissues. Zheng B, Li S, Liu Y et al., Sci Rep. 2017 Nov 7;7(1):14643. doi: 10.1038/s41598-017-15138-6. Spexin peptide is expressed in human endocrine and epithelial tissues and reduced after glucose load in type 2 diabetes. Spexin mRNA and protein are widely expressed in rat tissues and associate with weight loss in rodents of diet-induced obesity. Its location in endocrine and epithelial cells has also been suggested. Spexin is a novel peptide that involves weight loss in rodents of diet-induced obesity. Therefore, we aimed to examine its expression in human tissues and test whether spexin could have a role in glucose and lipid metabolism in type 2 diabetes mellitus (T2DM). The expression of the spexin gene and immunoreactivity in the adrenal gland, skin, stomach, small intestine, liver, thyroid, pancreatic islets, visceral fat, lung, colon, and kidney was higher than that in the muscle and connective tissue. Immunoreactive serum spexin levels were reduced in T2DM patients and correlated with fasting blood glucose (FBG, r=-0.686, P<0.001), hemoglobin A1c (HbA1c, r=-0.632, P<0.001), triglyceride (TG, r=-0.236, P<0.001) and low density lipoprotein-cholesterol (LDL-C, r=-0.382, P<0.001). A negative correlation of blood glucose with spexin was observed during oral glucose tolerance test (OGTT). Spexin is intensely expressed in normal human endocrine and epithelial tissues, indicating that spexin may be involved in physiological functions of endocrine and in several other tissues. Circulating spexin levels are low in T2DM patients and negatively related to blood glucose and lipids suggesting that the peptide may play a role in glucose and lipid metabolism in T2DM. This publication used a spexin antibody from Phoenix Pharmaceuticals. Gu L, Ma Y, Gu M, et al. Spexin peptide is expressed in human endocrine and epithelial tissues and reduced after glucose load in type 2 diabetes. Peptides. 2015;71:232-9. Spexin Enhances Bowel Movement through Activating L-type Voltage-dependent Calcium Channel via Galanin Receptor 2 in Mice. A novel neuropeptide spexin was found to be broadly expressed in various endocrine and nervous tissues while little is known about its functions. This study investigated the role of spexin in bowel movement and the underlying mechanisms. In functional constipation (FC) patients, serum spexin levels were significantly decreased. Consistently, in starved mice, the mRNA of spexin was significantly decreased in intestine and colon. Spexin injection increased the velocity of carbon powder propulsion in small intestine and decreased the glass beads expulsion time in distal colon in mice. Further, spexin dose-dependently stimulated the intestinal/colonic smooth muscle contraction. Galanin receptor 2 (GALR2) antagonist M871, but not Galanin receptor 3 (GALR3) antagonist SNAP37899, effectively suppressed the stimulatory effects of spexin on intestinal/colonic smooth muscle contraction, which could be eliminated by extracellular [Ca(2+)] removal and L-type voltage-dependent Ca(2+) channel (VDCC) inhibitor nifedipine. Besides, spexin dramatically increased the [Ca(2+)]i in isolated colonic smooth muscle cells. These data indicate that spexin can act on GALR2 receptor to regulate bowel motility by activating L-type VDCC. Our findings provide evidence for important physiological roles of spexin in GI functions. Selective action on spexin pathway might have therapeutic effects on GI diseases with motility disorders. This publication used a spexin peptide from Phoenix Pharmaceuticals. Lin CY, Zhang M, Huang T, et al. Spexin Enhances Bowel Movement through Activating L-type Voltage-dependent Calcium Channel via Galanin Receptor 2 in Mice. Sci Rep. 2015;5:12095. Spexin is a novel human peptide that reduces adipocyte uptake of long chain fatty acids and causes weight loss in rodents with diet-induced obesity. OBJECTIVE: Microarray studies identified Ch12:orf39 (Spexin) as the most down-regulated gene in obese human fat. Therefore, we examined its role in obesity pathogenesis. METHODS: Spexin effects on food intake, meal patterns, body weight, respiratory exchange ratio (RER), and locomotor activity were monitored electronically in C57BL/6J mice or Wistar rats with diet-induced obesity (DIO). Its effects on adipocyte [(3)H]-oleate uptake were determined. RESULTS: In humans, Spexin gene expression was down-regulated 14.9-fold in obese omental and subcutaneous fat. Circulating Spexin changed in parallel, correlating (r?=?-0.797) with Leptin. In rats, Spexin (35 µg/kg/day SC) reduced caloric intake ~32% with corresponding weight loss. Meal patterns were unaffected. In mice, Spexin (25 µg/kg/day IP) significantly reduced the RER at night, and increased locomotion. Spexin incubation in vitro significantly inhibited facilitated fatty acid (FA) uptake into DIO mouse adipocytes. Conditioned taste aversion testing (70 µg/kg/day IP) demonstrated no aversive Spexin effects. CONCLUSIONS: Spexin gene expression is markedly down-regulated in obese human fat. The peptide produces weight loss in DIO rodents. Its effects on appetite and energy regulation are presumably central; those on adipocyte FA uptake appear direct and peripheral. Spexin is a novel hormone involved in weight regulation, with potential for obesity therapy. This publication used a spexin peptide, a spexin EIA kit, and a leptin EIA kit from Phoenix Pharmaceuticals. Walewski JL, Ge F, Lobdell H, et al. Spexin is a novel human peptide that reduces adipocyte uptake of long chain fatty acids and causes weight loss in rodents with diet-induced obesity. Obesity (Silver Spring). 2014;22(7):1643-52. Coevolution of the spexin/galanin/kisspeptin family: Spexin activates galanin receptor type II and III. The novel neuropeptide spexin (SPX) was discovered using bioinformatics. The function of this peptide is currently under investigation. Here, we identified SPX along with a second SPX gene (SPX2) in vertebrate genomes. Syntenic analysis and relocating SPXs and their neighbor genes on reconstructed vertebrate ancestral chromosomes revealed that SPXs reside in the near vicinity of the kisspeptin (KISS) and galanin (GAL) family genes on the chromosomes. Alignment of mature peptide sequences showed some extent of sequence similarity among the 3 peptide groups. Gene structure analysis indicated that SPX is more closely related to GAL than KISS. These results suggest that the SPX, GAL, and KISS genes arose through local duplications before 2 rounds (2R) of whole-genome duplication. Receptors of KISS and GAL (GAL receptor [GALR]) are phylogenetically closest among rhodopsin-like G protein-coupled receptors, and synteny revealed the presence of 3 distinct receptor families KISS receptor, GALR1, and GALR2/3 before 2R. A ligand-receptor interaction study showed that SPXs activate human, Xenopus, and zebrafish GALR2/3 family receptors but not GALR1, suggesting that SPXs are natural ligands for GALR2/3. Particularly, SPXs exhibited much higher potency toward GALR3 than GAL. Together, these results identify the coevolution of SPX/GAL/KISS ligand genes with their receptor genes. This study demonstrates the advantage of evolutionary genomics to explore the evolutionary relationship of a peptide gene family that arose before 2R by local duplications. Kim DK, Yun S, Son GH, et al. Coevolution of the spexin/galanin/kisspeptin family: Spexin activates galanin receptor type II and III. Endocrinology. 2014;155(5):1864-73. Peptides derived from the prohormone proNPQ/spexin are potent central modulators of cardiovascular and renal function and nociception. Computational methods have led two groups to predict the endogenous presence of a highly conserved, amidated, 14-aa neuropeptide called either spexin or NPQ. NPQ/spexin is part of a larger prohormone that contains 3 sets of RR residues, suggesting that it could yield more than one bioactive peptide; however, no in vivo activity has been demonstrated for any peptide processed from this precursor. Here we demonstrate biological activity for two peptides present within proNPQ/spexin. NPQ/spexin (NWTPQAMLYLKGAQ-NH(2)) and NPQ 53-70 (FISDQSRRKDLSDRPLPE) have differing renal and cardiovascular effects when administered intracerebroventricularly or intravenously into rats. Intracerebroventricular injection of NPQ/spexin produced a 13 ± 2 mmHg increase in mean arterial pressure, a 38 ± 8 bpm decrease in heart rate, and a profound decrease in urine flow rate. Intracerebroventricular administration of NPQ 53-70 produced a 26 ± 9 bpm decrease in heart rate with no change in mean arterial pressure, and a marked increase in urine flow rate. Intraventricular NPQ/spexin and NPQ 53-70 also produced antinociceptive activity in the warm water tail withdrawal assay in mice (ED(50)<30 and 10 nmol for NPQ/spexin and NPQ 53-70, respectively). We conclude that newly identified peptides derived from the NPQ/spexin precursor contribute to CNS-mediated control of arterial blood pressure and salt and water balance and modulate nociceptive responses. Toll L, Khroyan TV, Sonmez K, et al. Peptides derived from the prohormone proNPQ/spexin are potent central modulators of cardiovascular and renal function and nociception. FASEB J. 2012;26(2):947-54. Spexin expression in normal rat tissues. Spexin is a highly conserved peptide which was recently identified through the bioinformatics approach. Immunohistochemical analysis of its expression has not yet been performed. Thus, in this study, we examined spexin location in a wide range of rat organs by both RT-PCR and IHC. RT-PCR identified spexin mRNA in all tissues examined. Spexin immunoreaction was mainly cytoplasmic. Spexin was immunohistochemically detected, although with different staining intensities, in epithelia and glands of skin and respiratory, digestive, urinary, and reproductive systems. Smooth muscle cells showed weak immunostaining, and connective tissue was negative. In the central nervous system, neuronal groups showed different intensities for reaction product. Immunoreaction was also found in ganglionic cells of both trigeminal and superior cervical ganglia and in photoreceptor, inner nuclear, and ganglionic layers of the retina. In the endocrine system, spexin immunoreaction was detected in the hypothalamic paraventricular and supraoptic nuclei; adenohypophysis, thyroid, and parathyroid glands; adrenal cortex and medulla (mainly ganglionic cells); Leydig cells; and thecal, luteal, and interstitial cells of the ovary. Because of its widespread expression, spexin is probably involved in many different physiological functions; in particular, location of spexin in neurons and endocrine cells suggests its roles as neurotransmitter/neuromodulator and endocrine factor. Porzionato A, Rucinski M, Macchi V, Stecco C, Malendowicz LK, De caro R. Spexin expression in normal rat tissues. J Histochem Cytochem. 2010;58(9):825-37. Expression of the spexin gene in the rat adrenal gland and evidences suggesting that spexin inhibits adrenocortical cell proliferation. 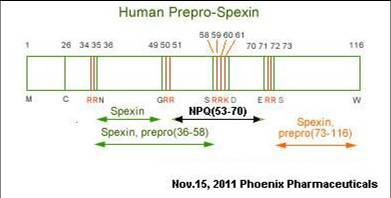 Spexin (SPX, also called NPQ) is a recently identified, highly conserved peptide which is processed and secreted. We analysed the SPX gene and its protein product in the rat adrenal gland to ascertain whether SPX is involved in the regulation of corticosteroid secretion of and growth of adrenocortical cells. In adult rat adrenal glands the highest levels of SPX mRNA were present in the glomerulosa (ZG) and fasciculate/reticularis (ZF/R) zones. High SPX gene expression levels were found in freshly isolated adult rat ZG and ZF/R cells. In cultured adrenocortical cells the levels of SPX mRNA were lower than in freshly isolated cells. SPX mRNA expression levels were found to be 2-3 times higher during days 90-540 of postnatal development than found during days 2-45. Prolonged ACTH administration lowered and dexamethasone increased adrenal SPX mRNA levels in vivo. Adrenal enucleation produced a significant linear increase in SPX mRNA levels, with the highest value occurring at day 8 after surgery, with control values taken on day 30 after enucleation. Immunohistochemistry revealed SPX-like immunoreactivity in the entire cortex of the adult male rat and in enucleation-induced regenerating cortex. A concentration of 10-6M SPX peptide stimulated basal aldosterone secretion by freshly isolated ZG. In prolonged exposure of adrenocortical cell primary cultures to SPX (10-6M) resulted in a small increase in corticosterone secretion and a notable decrease in BrdU incorporation. The results suggest the direct involvement of SPX in the regulation of adrenocortical cell proliferation; however, the mechanism of action remains unknown. Rucinski M, Porzionato A, Ziolkowska A, et al. Expression of the spexin gene in the rat adrenal gland and evidences suggesting that spexin inhibits adrenocortical cell proliferation. Peptides. 2010;31(4):676-82. There are currently a large number of "orphan" G-protein-coupled receptors (GPCRs) whose endogenous ligands (peptide hormones) are unknown. Identification of these peptide hormones is a difficult and important problem. We describe a computational framework that models spatial structure along the genomic sequence simultaneously with the temporal evolutionary path structure across species and show how such models can be used to discover new functional molecules, in particular peptide hormones, via cross-genomic sequence comparisons. The computational framework incorporates a priori high-level knowledge of structural and evolutionary constraints into a hierarchical grammar of evolutionary probabilistic models. This computational method was used for identifying novel prohormones and the processed peptide sites by producing sequence alignments across many species at the functional-element level. Experimental results with an initial implementation of the algorithm were used to identify potential prohormones by comparing the human and non-human proteins in the Swiss-Prot database of known annotated proteins. In this proof of concept, we identified 45 out of 54 prohormones with only 44 false positives. The comparison of known and hypothetical human and mouse proteins resulted in the identification of a novel putative prohormone with at least four potential neuropeptides. Finally, in order to validate the computational methodology, we present the basic molecular biological characterization of the novel putative peptide hormone, including its identification and regional localization in the brain. This species comparison, HMM-based computational approach succeeded in identifying a previously undiscovered neuropeptide from whole genome protein sequences. This novel putative peptide hormone is found in discreet brain regions as well as other organs. The success of this approach will have a great impact on our understanding of GPCRs and associated pathways and help to identify new targets for drug development. Sonmez K, Zaveri NT, Kerman IA, et al. Evolutionary sequence modeling for discovery of peptide hormones. PLoS Comput Biol. 2009;5(1):e1000258. Identification of novel peptide hormones in the human proteome by hidden Markov model screening. Mirabeau O, Perlas E, Severini C, et al. Identification of novel peptide hormones in the human proteome by hidden Markov model screening. Genome Res. 2007;17(3):320-7.